From the James Beard Award-winning, much-loved cookbook author and authority: a definitive compendium of Jewish recipes from around the globe and across the ages. Driven by a passion for discovery, the biblical King Solomon is said to have sent emissaries on land and sea to all corners of the ancient world, initiating a mass cross-pollination of culinary cultures that continues to bear fruit today. 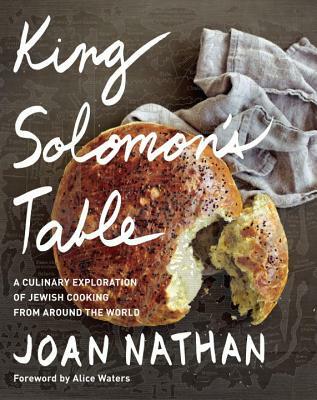 With Solomon’s appetites and explorations in mind, in these pages Joan Nathan—“the queen of American Jewish cooking” (Houston Chronicle)—gathers together more than 170 recipes, from Israel to Italy to India and beyond. Here are classics like Yemenite Chicken Soup with Dill, Cilantro, and Parsley; Slow-Cooked Brisket with Red Wine, Vinegar, and Mustard; and Apple Kuchen as well as contemporary riffs on traditional dishes such as Smoky Shakshuka with Tomatoes, Peppers, and Eggplant; Double-Lemon Roast Chicken; and Roman Ricotta Cheese Crostata. Here, too, are an array of dishes from the world over, from Socca (Chickpea Pancakes with Fennel, Onion, and Rosemary) and Sri Lankan Breakfast Buns with Onion Confit to Spanakit (Georgian Spinach Salad with Walnuts and Cilantro) and Keftes Garaz (Syrian Meatballs with Cherries and Tamarind). Gorgeously illustrated and filled with fascinating historical details, personal histories, and delectable recipes, King Solomon’s Table showcases the dazzling diversity of a culinary tradition more than three thousand years old. JOAN NATHAN is the author of numerous cookbooks, including Jewish Cooking in America and The New American Cooking, both of which won the James Beard Award and the IACP Award for best cookbook of the year. She was the host of the nation­ally syndicated PBS television series Jewish Cooking in America with Joan Nathan, based on the book. A frequent contributor to The New York Times, Tablet magazine, and other publications, Nathan is the recipient of numerous awards, including James Beard’s Who’s Who of Food and Beverage in America, Les Dames d’Escoffier’s Grande Dame Award, and Food Arts magazine’s Silver Spoon Award, and she received an honorary doctorate from the Spertus Institute of Jewish Culture in Chicago. She was Guest Curator of Food Culture USA for the 2005 Smithsonian Folklife Festival, and a founding member of Les Dames d’Escoffier, and appointed to the Kitchen Cabinet of the National Museum of American History. Born in Providence, Rhode Island, Nathan graduated from the University of Michigan with a master’s degree in French literature and earned a master’s in public administration from Harvard University. For three years she lived in Israel, where she worked for Mayor Teddy Kollek of Jerusalem. In 1974, working for Mayor Abraham Beame in New York, she cofounded the Ninth Avenue Food Festival. The mother of three grown children, Nathan lives in Washington, D.C., and on Martha’s Vineyard with her hus­band, Allan Gerson.